What Is Tele-Dentistry? And How Is It Helping Low Income Families in California? Imagine having a dentist come to your school and offer dental service free without having to go to a regular dentist office. That's exactly what the “Virtual Dental Home Demonstration Project” is doing throughout California. And it's considered a "Godsend" for low-income people, many of whom have never been to the dentist before. The program provides free dental service to low-income people, both children and adults, in 50 locations throughout the state of California, including Pacoima, Santa Monica, San Jose, Santa Cruz, East Palo Alto, San Francisco, Sacramento and Eureka. It's referred to as a “teledentistry” program for low-income patients who can't afford dental care. Here's how it works. 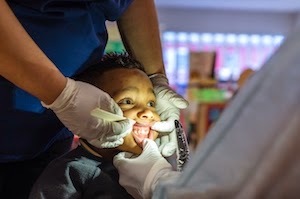 Dental assistants and hygienists visit children and adults at schools, nursing homes and other locations where they provide initial dental exams. They then consult with nearby dentists, discussing the patients needs, and determine what services the patient needs. The result is either providing the dental service on site or sending the patient on to a local dentist for further dental services. The program is funded by grants from non-profits, trade associations and others. In the future, the project aims to have Medi-Cal, the government health insurance program for the poor and disabled, pay for procedures. A bill to expand the program across the state has been passed in the state Assembly and is awaiting approval by the state Senate. If the bill passes, the program anticipates savings in the long run by providing more preventive dental care that could save far more money by reducing dental costs through improved care.